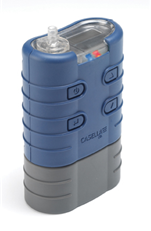 Casella CEL offers its TUFF line of personal air sampling pumps that feature a sealed case with over-molding that protects it from damaging moisture, extreme temperatures, solvents, and impact. Pumps possess a flow range from 5 ml/min to 4.5 l/min, and incorporate a double-acting diaphragm mechanism with digital control. Pump operation is guided by an intuitive user interface displaying real-time flow, sampled volume with run duration, a simple battery "fuel gauge" and alarm for flow or battery fault conditions. Typical run times of more than 30 hours (depending on media and flow rate) and meet applicable NIOSH and EN requirements.